I took this picture from the inside of a tour bus on Zhong Shan Lu (中山路) in Quanzhou (泉州）on February 8, 2012. It was rush hour in downtown, and I suddenly heard a collective gasp from the other side of the bus. I’ve rarely heard an entire group of people in China collectively make pitying noises (nothing in particular meant by that), so I jumped up to see what they were looking at. 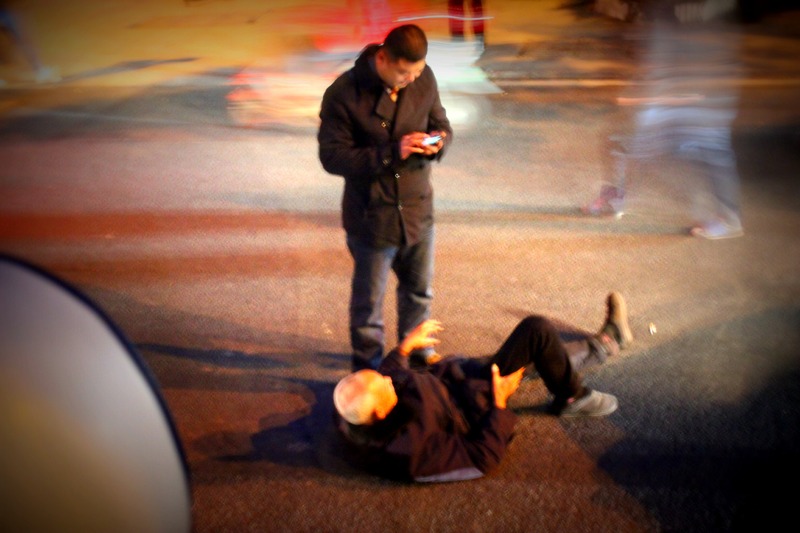 The younger man is standing over an old man, who he hit with his car (parked on the right, outside the frame, blocking traffic). The old man tried to get up twice, but the driver seemed to tell him to stay down. He then starts to do something on his phone as the old man still reaches out for help. Incidents such as this one attract special attention in China ever since the Peng Yu case of 2006, in which a Nanjing judge ruled that the man who helped an old lady stand up off the curbside had in fact knocked her down. Although there was no evidence for this, the judge issued the statement that “any ordinary person would not help someone unless they themselves had knocked that person down.” He was then required to pay for her medical expenses. Last fall (2011), two-year-old Yue Yue made international headlines after being hit by a van twice. Eighteen people walked past her without doing anything, afraid of the consequences. See earlier post. Where many people would look at the scene depicted above and first ask “is he alright?”, in China there is a whole other inferred dimension. It seems that indeed the man in the picture is trying to help the old man, and that this will not turn out to be another Yue Yue tragedy. Let’s hope that it also does not turn into the circus that the Peng Yu case continues to be. 08 Feb	This entry was published on February 8, 2012 at 8:27 pm and is filed under China. Bookmark the permalink. Follow any comments here with the RSS feed for this post. The Peng Yu plot thickens- he stated last month that, in fact, he had pushed her to the ground. He sounds like a real charmer. Whatever the case may be, something is fishy- and considering the impact his 2006 ruling has had on the mindset of so many, whether or not he pushed her seems almost irrelevant; the repercussions have been very real. One of my law teachers was a lawyer in the Nanjing courts and said that, about 8 months after the case closed, they found his 110 call in which he asked for help for having knocked over an old lady (but this was apparently not made public because they wanted to case buried). I’m surprised this info came out, but it doesn’t make one lick of difference. The legal system still has the same flaw, and people are still afraid the same thing will happen to them. If anything, the fact that he DID push her over makes the whole situation seem like even more of a circus of moral dearth.